On Sunday, October 30, Sister Heloise Cruzat welcomed sisters, family and friends to the Evening Prayer and Labyrinth of Remembrance and Thanksgiving sponsored by the Labyrinth Committee. The committee began offering this observance in the fall of 2005 with prayer and the opportunity of a labyrinth walk in the time prior to the liturgical feasts of All Saints and All Souls. This year’s observance was one of our local Order of Preachers 800 year Anniversary celebrations. 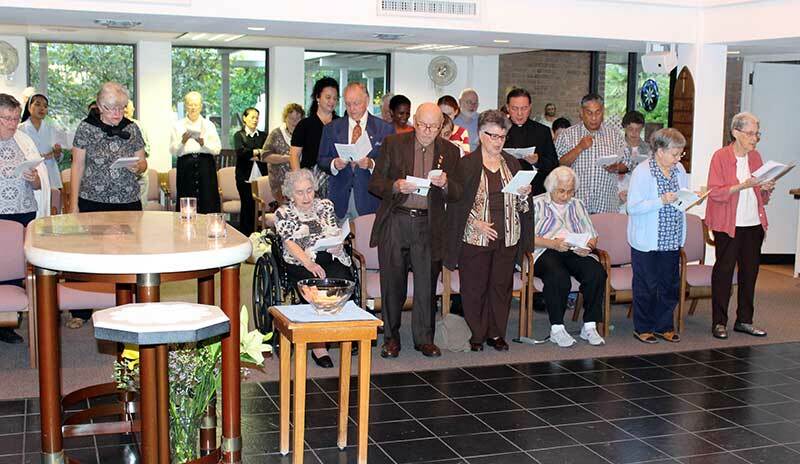 Since the Order and the Dominican Sisters of Houston have a strong legacy in music and art, our customary prayer was expanded to include both music and art components. Sister Anna Marie Flusche began our program with an organ concert. She began the concert with the familiar “Jesus, Joy of Our Desiring” by Bach and chose “O How Blest Are You Whose Toils Are Ended” by Brahms, an appropriate lead in to our prayer. As prayer began, we were asked remember and acknowledge the debt of love and gratitude we owe to our sisters, our families and friends who have walked before us. Earlier mementos of loved ones were placed on altars. We also held in prayer those who are suffering from the death and destruction of war, violence, homelessness, and poverty throughout the world. After prayer, we were invited to walk the labyrinth led by Margaret Harle, or participate in a guided tour of Sister Mary Peter Tremonte’s art pieces led by Sister Kitty Carter. Sister Mary Peter was a sculptor and liturgical designer. The volume of her work over 40 years speaks of her Dominican mission to spread the word of God through liturgical and religious art. She began with scripture, pulled out the story, identified the persons and brought them to life. Many of her pieces are displayed in the buildings and on the grounds of the Dominican Sisters of Houston. Following the labyrinth walk and art tour, we were invited to a reception hosted by the Dominican Family and an exhibit of Dominican organ builders assembled by Sister Anna Marie. Sister Anna Marie has written extensively on the subject of priests and religious who were organ builders. Her works include an article, “Willem Hermans: Organ-Builder of the Society of Jesus,” (The Organ Yearbook) and a presentation on the Cavaillé-Coll family of organ-builders, the first of whom was a Dominican lay brother. Her book, The Life and Legend of Gerbert of Aurillac: The Organbuilder Who Became Pope Sylvester II, was published in 2005.